Dr. Hensiek founded his practice in 1984. His goal is to create a family health care center where patients find all modern treatment options, a warm and open atmosphere to re-discover good health. Dr. Hensiek has a BA in Physical Health from UCSB and received his doctor of chiropractic degree from Western States Chiropractic College in Portland, Oregon. Dr. Hensiek is a certified Industrial Disability Evaluator. He is an active member of the American Chiropractic Association and the California Chiropractic Association. In addition he attends yearly educational seminars and courses. 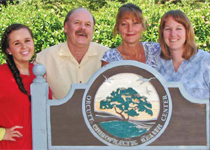 Our knowledgeable staff is dedicated to natural chiropractic care. Our Office Manager is available for specialized billing or insurance questions. Our Certified Massage Therapist is an integral part of our holistic approach to your good health.